'More powerful than a locomotive' is usually in comics associated with Superman, but can easily be applied to artists who consistently produce quality work on whatever assignment they land, often while other 'trending' artists boom and burst around them. Jim Calafiore is one of these steam trains. From pitching a Juggernaut ongoing to one of my all-time fan-favourites Force Works he has literally done it all. IADW) It is pretty hard to know where to start here. The defining 'Calafiore image' for me is your cover to Aquaman #17. 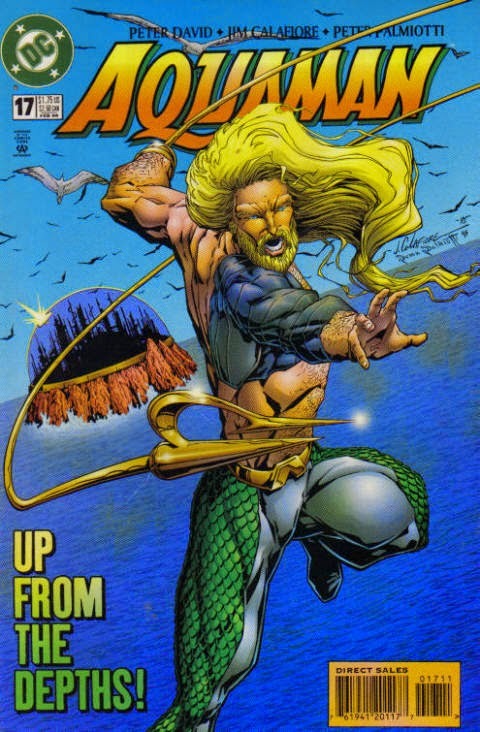 This wasn't far into Peter David's hook handed relaunch of DC's aquatic-icon. Was there any trepidation in picking up this hot potato? Jim Calafiore) My first work on Aquaman was issue 10. And there wasn't any hesitation about taking the work. Aquaman was actually a character I always liked, so it was cool to get the gig. And while I didn't know Peter before, I had been a big fan of his, especially his Hulk run. IADW) From Armorines to Deadpool, you've literally taken on a multitude of assignments, writing, drawing and/or inking. What is your attitude to work, that you feel has proven to be the secret to your ongoing success? J.C.) Well, I never turn down a job… But I think one thing is, besides that I do (I hope) a good job, is that I make deadlines. On a monthly book, that's important. Editors don't like headaches. IADW) In contrast to creating worlds in Exiles, you helped craft the team whose only world was themselves in Secret Six. One of the best books of DC's recent past, are their any positive insights you can share from the title for those going through Six-withdrawal? J.C.) Working with writer, Gail Simone; and getting to do all the crazy nasty stuff we did. Despite the critical success, we weren't the biggest selling book, so we didn't seem to be watched that closely. It let us do so much that I'm not sure could've been done on say Superman. I always said that we were practically a Vertigo book. IADW) With Gail, you've created Leaving Megalopolis. A successful Kickstarter, where everyday civilians rise up against their super-powered heroes turned oppressors. With Dark Horse collecting the debut issues for store release this September, is there anything you want to say on the project's future? J.C.) Leaving Megalopolis and the Kickstarter experience has been great; and we did it as a direct result of everyone telling us how much they missed Secret Six. Gail and I are definitely planning sequels; we're ramping up for volume 2, which I think we will do through Kickstarter again. IADW) Who is your personal 'Superman' / inspirational figure? J.C.) I don't think I really have an "inspirational" figure; lots of people I admire for what they do, or how they live, and plenty of artists I look up to and take inspiration from. And while Moebius is my artistic god, there's not a single person I can point to. It's a collection of people. Once again I thank Jim for all his time and efforts in doing this interview. As my nostalgia for 90's comics grows, especially in terms of DC and Marvel's Avengers line, it is nice to see that one of the guiding talents in both, is still wildly active over a decade on. What do you think? Let me know your thoughts below! For all things Calafiore, be sure to visit jimcalafiore.com For more On The Five interviews with the likes of Mike Grell, Dan Jurgens and Bob Layton, click here. I've always enjoyed his art, especially, Aquaman and Secret Six. Such an underrated, consistent talent I say. Seems like a hell of a guy, and true professional as well. Thanks Dale - yeah, I've always liked his work too. Around the Avengers 'Crossing' era, he was working on Avengers, Force Works and War Machine - maybe not at the same time, but within weeks of each other, and each issue was amazing stuff. Like you say, he's a reliable 'wow maker' and I was glad to get some time from him in order to say just that.